2013/2014 home shirt unveiled – not to be used until end of September. 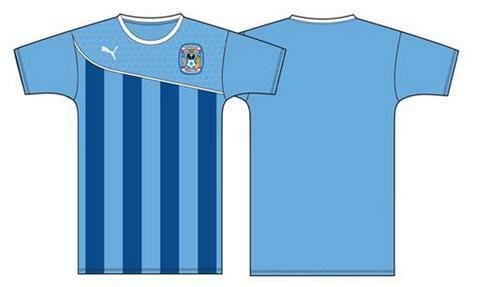 Coventry City Football Club have today confirmed the design of their 2013/2014 home shirt – a week after most fans spotted the strip on the advertisement for the announcement that Sky Bet were the new sponsors of the Football League. However, due to Coventry City Limited still being in administration, City players will not done the strip until at least the end of September. Until then, due to Football League rules stating that clubs must wear their registered home colours, City will wear the 2012/2013 home strip, with the sponsor’s logo on the front of the shirt covered. City supporters will not be able to purchase the shirt before City have been out of administration for 16 weeks, however most City fans will boycott the purchase of the strip if the proposed groundshare at Sixfields goes ahead as part of the ‘Not One Penny More’ campaign. The colour of the shorts and stockings have not yet been disclosed, however they are likely to be the darker shade of royal blue featured in the stripes. « 2013/2014 Squad numbers announced.